With the status of Jeep’s on-again/off-again Range Rover competitor up in the air, it’s a great opportunity to take a look at their previous range topper, the Commander. Today’s Nice Price or Crack Pipe ’06 has a new Hemi and a necker’s knob, but is its price down to earth? Wow, an 84% Crack Pipe loss for yesterday’s Ford-rocking 1984 Volkswagen Vanagon! I have to admit, I did not see that coming. Still, it was a bold move and someone had to do something about how crazy VW Type 2 Diabetes prices have gotten. Good on y’all! Now I want to talk about Jeep Commanders. 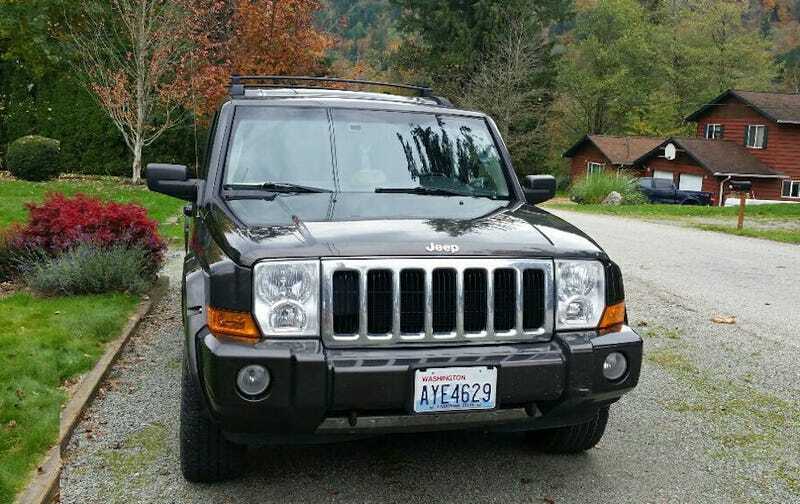 Specifically I want to discuss this particular 2006 Jeep Commander Limited. Why, you might ask, would we want to do that? It’s because Jeep is presently hemming and hawing over whether or not to release some sort of new generation of Grand Wagoneer. That would be an uber-Jeep based off the already pretty swank-when-you-want-it-to-be Grand Cherokee. I think the reason they’re so reticent to pull the production trigger is because their last attempt was the Commander, and I’ll bet that right now is the first time in a decade you’ve ever given those truck even one iota of attention. Yep, the Commander was a bit of a sales dud, having racked up just over 200K in its six-year production run. In contrast, the Grand Cherokee, upon which the Commander was based, sold three times as many over the same time frame. Blame the high gas prices that killed off a lot of big SUV sales at the time. Blame the economy. Or, blame the Commander itself. One final indignity: according to Chrysler, the Commander’s successor was the three-row Dodge Durango. Ouch! Well, let’s have a look at this big box and see if we all missed the boat and it really holds appeal, especially now that depreciation has taken its toll. This ’06 Limited comes with 125,000 miles on the clock, and only 10K of that on what’s said to be a rebuilt 5.7-litre, 330-horsepower Hemi V8. The ad claims the motor was sourced from a place called Rising Sun Motors in Bellingham Washington. Strangely, it also notes “All new seals and gaskets including timing belt and water pump.” I can’t tell if that’s all since the mill was dropped in, or that’s what the seller considers constitutes a “new” motor. Whichever it is, the truck is said to be a daily driver. A five-speed automatic backs up the V8 and it delivers its power to all four wheels via either Jeep’s Quadra-trac II or Quadra-drive II systems. The ad does not note how this one was optioned. The truck looks to be in great shape, and about as “Jeepalicious” as you could want. The styling of the Commander is reminiscent of the Cherokees past, with the addition of a clever step-up roof that allows third row passengers to lord their higher position over those in front. Huge grab handles and an equally big American flag adorn the back end on this one. Inside, this Jeep rocks a really interesting color combination. The general color is beige, but the seating surfaces are all in a deep burnt orange. I wonder who came up with that? I mean “burnt orange.” I’ve tried burning oranges and I can attest they don’t anything look like that when hit with a flame. Where was I? Oh, yeah, inside the truck. Take a gander at the steering wheel and you’ll find one of this truck’s coolest features, a necker’s knob. Alternatively you could call it a brodie knob. This make one-handed steering effortless, and frees up your other hand for... well, you get the picture. Overall, the interior looks like a pretty nice place to hang, and seems to have just about every option Jeep could throw in there a decade back. The seller is asking $10,500 for this truck, and if you take a look at what others are asking you find that to be on the high end. I doubt many of the others however have the reasonably fresh motor or that awesome steering wheel accessory, and that’s why we’re gauging this one’s value today. What’s your take on this forgotten Jeep and its $10,500 price? Is that a decent asking to jog your memory? Or, is that way too much to take Command? Bellingham WA Craigslist, or go here if the ad disappears. For $19,000, This 1984 VW Vanagon Asks, Have You Driven A Ford Lately?